Elite Training Systems is proud to announce this year’s Spring Football Camp! 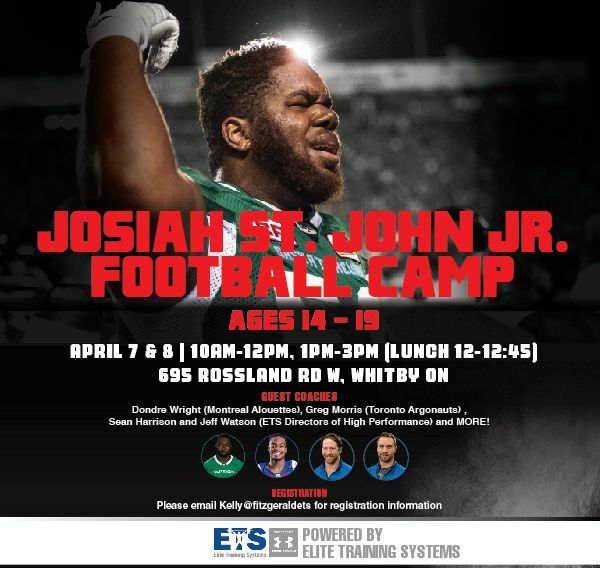 Camp will feature two full days of Football specific skills for all positions featuring current CFL players Josiah St.John (Saskatchewan Roughriders), Dondre Wright (Montreal Alouettes), Greg Morris (Toronto Argonauts) and more. On field skill work will be complimented by Strength & Conditioning sessions provided by Elite Training Systems, current Strength Coaches of Chris Long, back to back Super Bowl Champion (2017/2018) and Luke Willson Super Bowl Champion (2013) as well as many CFL and collegiate players. WHAT TO BRING – Appropriate training attire (Shorts, T-shirt, Running shoes etc.) and please pack water and a large meal for Lunch!